It’s like those London buses: you wait for ages then several turn up at once. 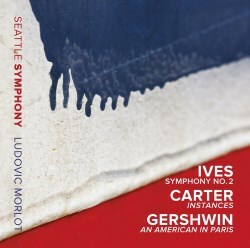 I'm referring to Volume 1 and Volume 2 of Sir Andrew Davis’s Melbourne Ives cycle and to these two recordings from Ludovic Morlot and the Seattle Symphony. I was very disappointed by the latter’s Ravel and Saint-Saëns (review), but a preliminary listen to their Ives was most encouraging; that goes for both the music-making and the sound. Also, Ivesians will be pleased to note that Morlot uses the critical editions of all these scores, something that Davis failed to do in his Melbourne account of the First Symphony. I had planned to haul out my various Ives sets for comparative purposes, but such is the pleasure generated by these Seattle performances that I was tempted to just sit back and enjoy the music. However, I couldn’t resist dipping into rival recordings from Leonard Bernstein, Michael Tilson Thomas, Andrew Litton and, of course, Andrew Davis. In the past I've praised the latter’s live Barbican series from January 1996, which was nothing short of a revelation. I do hope the BBC, who recorded all those performances, will find a way to make them available to the listening public. I've suggested cover-mounted CDs on their monthly music magazine. Until then we'll just have to settle for off-air tapes. Morlot’s first album opens with a warmly expressive account of the Second Symphony. He and his players are rhythmically alert, yet they find a genial flow to the first movement that I like very much indeed. The recording is splendid, with a nicely rounded bass and a clean, extended treble. As for Ives’s quotes from popular tunes – one of the composer's most endearing trademarks - they leap from the mix, sounding as fresh as the day they were filched. Even more impressive is Morlot's response to the second movement – marked Allegro – which has remarkable clarity and thrust. Goodness, these players are at their committed and passionate best. Not only that, Morlot shows himself to be a born Ivesian; he’s attuned to the composer’s unique sound world, so none of the score’s quirky details pass unnoticed. And the Seattle brass, particularly bracing in this Allegro, deserve to be mentioned in dispatches. Then there's fhe Adagio cantabile, which emerges with perfect musculature and a strong sense of purpose. As for the lower strings they sound super-lustrous, while in the finale the horns play with a nuanced beauty that’s just breathtaking. Having done so well thus far Morlot opts for Bernstein’s ugly splurge on the symphony’s last chord. At least it's not so protracted; in fact, anyone with editing experience should be able to prune it easily enough. For all their faults Lenny’s recordings of the Second – for CBS/Sony and Deutsche Grammophon – are long-time favourites of mine, not least because they capture the unrepentant feistiness of this great score. Morlot does that, and a whole lot more; factor in first-class playing and terrific sound and it’s little wonder that this is now my Ives 2 of choice. The audience certainly loved it, and I daresay you will too. The fillers, the world première of Carter’s Instances and a fizzing performance of Gershwin’s An American in Paris, are no less desirable. A minor quibble; the gap between these two pieces is far too short. That may not be an issue on the CD, though. 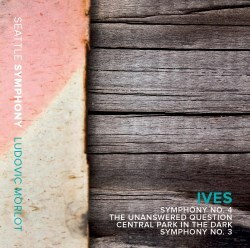 The second album opens with a performance of Ives’s great musical mélange, the Fourth Symphony. In the first and last movements the Seattle Chorale are both crisp and fervent, while Morlot and his three assistants ensure that the work’s carousings and collisions are disciplined enough for details and cross-rhythms to register with ease. Just as important are those hymn tunes, which are played with a breadth – and an abiding affection – that seems just right for the piece. While there’s a great deal to admire in Morlot’s Fourth it doesn’t supplant Davis’s Barbican account in my affections. Indeed, the latter has an even greater sense of the music’s ambition – its sheer modernity – than Morlot’s. However, the more I listened to this Seattle Fourth the more persuasive it seemed. There’s a tremendous drive here, not to mention a palpable joy in all those bands and borrowings, that’s hugely rewarding. So while Morlot isn't as volatile as Davis he's always thoughtful and proportionate in his response to this score. The recording is full and detailed, with a spectacular range when required. Cristina Valdés play a mean piano and Joseph Adam’s discreetly voiced organ part is nicely judged. I do miss the mournful theremin though, as it adds a strange twist to the finale. Morlot’s readings of the two Contemplations, better known as The Unanswered Question and Central Park in the Dark, are no less distinguished. Indeed, these musicians play this music as if to the manner born. Trumpeter David Gordon is haunting in The Unanswered Question, and the opposing flutes are bright but never brittle. As for Central Park in the Dark it has a brooding loveliness that’s very well caught by the recording team. Davis Mark 1 is still very striking in both works, but a combination of finely calibrated direction, exemplary playing and first-rate sound puts these new versions way out in front. There are just as many felicities to be found in this Seattle Third, among them the genial baroquerie of The Old Folks Gatherin’. Morlot brings out the gentle stateliness of this music more lovingly than most. Children’s Day is just as affectionately characterised, the robust Seattle strings as magnificent as ever. It helps that Morlot makes Ives’s delectable rhythms lift and bounce with such ease and naturalness; more important, there’s a profound humanity to this performance that’s very affecting. E. M. Forster once spoke of ‘the thousand little civilities that consecrate life’, and that vital, binding spirit shines trough in Morlot's radiant reading of Communion, the symphony's aptly titled finale. I may have had reservations about this team’s Ravel and Saint-Saëns, but these new additions to the SSM catalogue are in another league entirely. In particular I’m struck by the wonderful rapport that now exists between these American musicians and their French music director; this explains, in part at least, why these performances are so compelling. I wouldn’t want to be without Bernstein, Tilson Thomas, Litton or Sinclair, but if pushed to choose just two Ives recordings for my desert island I'd plump for Morlot's pair. Outstanding Ives, superbly played, sung and recorded; even the fillers are excellent.